Billionaire Bill Ackman’s Pershing Square recently published its 2018 Annual Investor Letter, in which, among other things, discussed in thesis every position from its 13F portfolio. If you want, you can track a copy of the fund’s annual letter 2018 – here. Bill Ackman said about Starbucks Corporation (NASDAQ:SBUX), one of the 2018 additions to its equity portfolio, that it should continue to achieve long-term high earnings. Starbucks (“SBUX”)Starbucks, a new addition to the portfolio in 2018, is the global dominant brand in the specialty coffee category, with 30,000 owned and licensed stores that generate approximately $35 billion in annual systemwide sales. The category benefits from a loyal customer base with a frequent consumption habit and trade-up potential. Starbucks’ market position is protected by a wide moat with competitive advantages over both low-cost and boutique players. Starbucks is one of the rare mega-cap businesses with a long runway for reinvesting free cash flow at exceptionally high rates of return. New Starbucks stores have industry-leading unit economics, which we estimate generate a pretax return on investment of 55% in the U.S. and 75% in China. The company should continue to grow revenues at a high-single-digit rate driven by unit growth in underpenetrated markets such as China where per-capita coffee consumption is less than 1% of U.S. levels, and product innovations which have generated continued same-store-sales growth.Despite an enviable long-term track record, Starbucks’ stock was down modestly over the three years prior to our investment while earnings grew 50% over that timeframe, allowing us to acquire Starbucks shares at a 25% discount to the company’s historical average valuation multiple of 26 times forward earnings. We believe that the reduced valuation was driven by concerns regarding a slowdown in U.S. same-store sales, the perceived risk to its achieving its long-term financial growth targets, and uncertainty due to the company’s senior leadership transition and management turnover. Starbucks has demonstrated strong progress in addressing each of these concerns since we made our investment. Driven by a resurgence in Starbucks’ core beverage category, U.S. same-store sales grew 4% in each of the last two quarters, following four consecutive quarters of between 1% and 2% growth. Tailwinds that should drive continued growth include the rollout of the Nitro cold beverage platform from 40% of the store base in January to 100% by the end of September, new marketing efforts to less frequent customers, loyalty program changes to allow members to earn rewards more quickly, the rollout of delivery, and the wind-down of inventory rationalization efforts. Management unveiled updated long-term financial growth targets at its biennial investor day in December, which we believe will prove to be conservative over time, particularly management’s operating profit margin guidance. We are impressed by the bold actions the new leadership team has taken to simplify the business and drive improved results including portfolio realignment, an ongoing overhead reduction program, and a $20 billion share buyback program, which should reduce shares outstanding by about 20% over the 2018-2020 timeframe. In 2018, Starbucks’ shares including dividends increased 27% from our average cost at inception and an additional 11% year-to-date in 2019. Despite this outsized return since our investment, we believe prospective returns remain compelling as the company should continue to grow long-term earnings at a high rate due to strong secular growth and outstanding unit economics. Starbucks Corporation is an American world famous coffeehouse chain, which manages more than 30,000 location over the world. It was launched back in 1971, in Seattle, Washington. Since the beginning of the year, its shares have gained almost 15%, and on March 29th, it was trading at $73.96. At Q4’s end, a total of 42 of the hedge funds tracked by Insider Monkey held long positions in this stock, a change of 27% from the previous quarter. 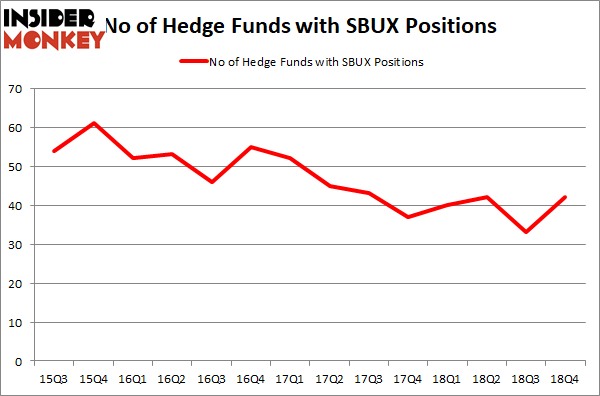 The graph below displays the number of hedge funds with bullish position in SBUX over the last 14 quarters. So, let’s find out which hedge funds were among the top holders of the stock and which hedge funds were making big moves. 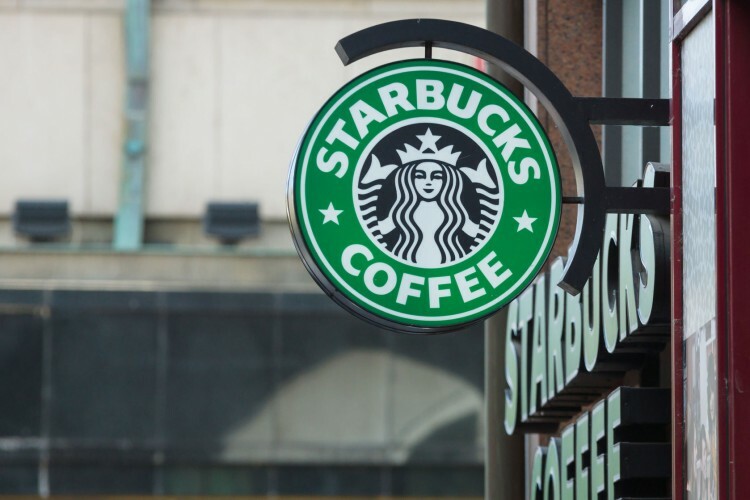 The largest stake in Starbucks Corporation (NASDAQ:SBUX) was held by Pershing Square, which reported holding $757 million worth of stock at the end of September. It was followed by Cedar Rock Capital with a $636.6 million position. Other investors bullish on the company included Millennium Management, Two Sigma Advisors, and Arrowstreet Capital. In its last financial report for the first quarter of Fiscal 2019, ended December 30, 2018, Starbucks Corporation disclosed consolidated net revenues of $6.6 billion, up by 9% from the corresponding period in 2017. It also reported GAAP EPS of $0.61, down by 61% over the previous year, and Non-GAAP EPS of $0.75, up by 15% from the same period in 2017.